She was like thousands of other plaster Madonnas manufactured at a plant in Sicily and sold throughout the country for a few lira. This particular Madonna was sold as a wedding present from a friend who decided that such a statue would be an appropriate gift for Antionetta and Angelo Iannusco, who were married in Syracuse, Sicily, in the spring of 1953. 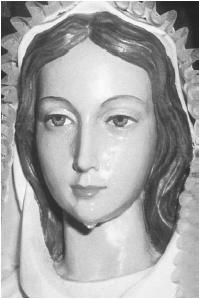 Then, on the morning of August 29, 1953, as Antionetta prayed devoutly to the Blessed Mother to grant her surcease from the pains of her pregnancy, the statue began to weep. At first her mother-in-law and sister-in-law were skeptical, but then they witnessed a virtual torrent of tears flowing from the eyes of the plaster Madonna. Angelo, who prided himself on his atheistic philosophy and communistic politics, became so moved by the apparent supernatural manifestation that he left the Communist Party and assisted the priest as he said mass over the weeping Madonna. Doubting neighbors, cynical journalists, and rational, scientific investigators were baffled by the phenomenon of the weeping statue in the Iannusco household. When news of the miracle Madonna spread throughout Italy, thousands of people hurried to view it for themselves. The southeastern Sicilian community's hotels were quickly swamped with requests for accommodation. Before the Iannusco's home could be crushed by the onslaught of curious pilgrims, the Syracuse Police Department agreed to remove the little Madonna to their headquarters for safekeeping. As the squad car moved through the streets, a patrolman carefully held the statue on his lap. Soon his jacket was drenched with tears. A skeptical detective caught several tears in a chemist's vial and, without identifying the liquid, sent the specimen to a police laboratory for analysis. The next morning the irritated director of the lab berated him for wasting his time analyzing such substances as human tears. Hardly any time passed before the crippled, the lame, and the ill from all over Italy were soon gathering before the weeping Madonna. The tears were caught on a cloth and wiped on the bodies of the afflicted. A middle-aged man recovered the use of a crippled arm. A three-year-old girl stricken with polio was able to discard the stainless steel braces that had encased her twisted legs. An 18-year-old girl who had been struck dumb 11 years before began to speak. Hundreds of others claimed to have received a healing blessing from the tears of the little Madonna. The Madonna's tears ceased to flow on the fourth day of the phenomenon, but exactly one month later, the statue was carried through the streets of Syracuse at the head of a procession of 30,000 people. Since that day, thousands of pilgrims have flocked to the shrine of the little Madonna, including more than a hundred bishops and archbishops and several cardinals. Her glassed-wall case, capped with a bronze cross, is surrounded by dozens of crutches and braces that have been left there as silent testimony of hundreds of miracle healings. Hopeful that their city would become known as the "Italian Lourdes," the citizens of Syracuse purchased a 12-acre site and constructed a lattice-type pagoda shrine for the Madonna. Large ramps lead up to the entrance and the 400-foot high walls. Thirty-six small chapels surround the shrine and await the devout. In a message to the Sicilians in 1958, Pope Pius XII (1876–1958) said: "So ardent are the people of Sicily in their devotion to Mary that who would marvel if she had chosen the illustrious city of Syracuse to give a sign of her grace?" While the skeptical explain weeping statues and icons of the Madonna, Jesus (c. 6 B.C.E.–c. 30 C.E. ), or other holy figures as bizarre moisture condensation at best and as outright fraud at the worst, throughout the world and all of Roman Catholic Christendom, the ordinary statues or paintings become highly venerated objects of faith. As the old saying goes, "For those who believe, no explanation is needed. For those who do not believe, no explanation is possible." Just before Christmas in 1996, a painting of Jesus was seen by hundreds of eyewitnesses to be weeping red tears. This painting was no ordinary icon, for it hangs in the Bethlehem Church of the Nativity, above the spot where Christian tradition maintains Jesus was born. A Muslim cleaning lady was the first to see a light that came from the painting just prior to the tears flowing from the eyes of Jesus. Since her sighting, thousands of Christians of all denominations, along with many Jews and Muslims, have witnessed the tears. Rooty Hill, near Sydney, Australia: Since 1994, tears have streamed from the eyes of a statue of Our Lady of Fatima in a small, private home. Grangecon, Ireland: Three weeks after a retired postmaster and her daughter noticed tears and drops of blood tricking from the eye of a statue of the Madonna one day in 1994, 3,000 visitors from all over the world had arrived to witness the phenomenon for themselves. outright fraud. 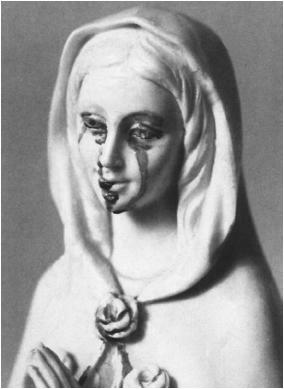 The weeping of blood is dismissed as normal condensation colored by the reddish-hued paints so often used in the formation of religious statues. For the faithful, who point to dozens of dramatic healings, hundreds of mystical experiences, and thousands of religious conversions as their evidence that something supernatural is occurring around these icons, such phenomena as the weeping madonnas are likely to be interpreted as physical signs that the spiritual presence of the holy figure is with them. Delaney, John J. ed. A Woman Clothed with the Sun. Garden City, N.Y.: Doubleday, 1961. Hayford, Jack. The Mary Miracle. Ventura, Calif.: Gospel Light, 1994. Kirkwood, Annie. Mary's Message of Hope. Nevada City, Calif.: Blue Dolphin Publishing, 1995. Steiger, Brad and Sherry Hansen Steiger. Mother Mary Speaks to Us: Life-Changing Encounters with the Virgin Mary. New York: Dutton, 1997. Weeping Statues Archives. http://www.mcn.org/1/Miracles/weeparchive.htm. 1 October 2001. Zimdars-Swartz, Sandral. Encountering Mary. New York: Avon Books, 1992.